Everyone loves fun summer time games outside but what do you do when it gets dark? Many people just go inside and think that the fun is over but not this time! 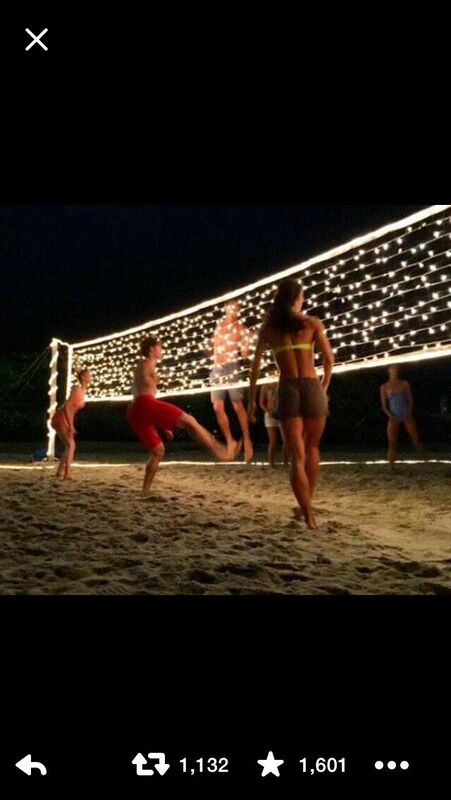 I have a great idea as to how to add lighting to a volley ball net and court to keep the fun going all night long! Many people love volleyball as a summer time activity at family gatherings, reunions with friends, or even just family fun in the back yard. Once the sun goes down its hard to play a game you need light to see but we have a great idea. First the actual court some may have sand and some many have grass but either way you can line the court with rope lights. You can use any color rope lights and even reds and blues for Memorial Day or 4th Of July party's. That will start the foundation to your nighttime court. Next you look at the net what kind of lights can you use to run threw the netting or let hang from the top? There are many colors to choose from when it comes to these but I think the best color to use is bright white or warm white lights. you can use the netting lights or regular string lights and run them threw the nets. This will light up the whole court for lots of nightly fun. You can also wrap the poles in different color lighting for certain themed parties or if you just have a favorite color you love. This will be so easy to do to add a little more fun at night because who likes going in when it gets dark out that's when the party's and get together's start to get fun. With a little DIY you will have an amazing volleyball court set up for all those long summer nights! Now this looks like a blast and fun for all ages! All it takes is a little time and DIY skills and you will have the perfect backyard everyone wants to play at! Copyright All Things Christmas And More. All Rights Reserved. eCommerce Software by 3dcart.